WASHINGTON - President Obama outlined a broad new military strategy yesterday, one that refocuses the armed forces on threats in Asia and the Pacific region, continues a strong presence in the Middle East, but makes clear that US ground forces will no longer be large enough to conduct prolonged, large-scale counterinsurgency campaigns like those in Iraq and Afghanistan. In an unusual appearance in the Pentagon briefing room, Obama put his mark on a military strategy that moves away from the grinding wars he inherited from the Bush administration and relies more on naval and air power in the Pacific and the Strait of Hormuz as a counterbalance to China and Iran. 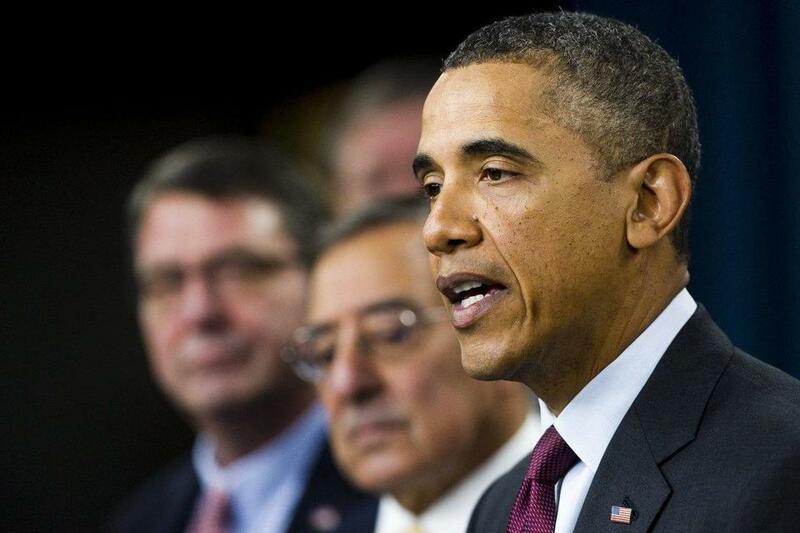 “Now, we’re turning the page on a decade of war,’’ Obama said in his prepared remarks. He called it “a moment of transition’’ that allowed him to look ahead and determine the kind of force - a smaller one, he said - that the nation needs in the future. His strategy embraces hundreds of billions of dollars in cuts to the military, making it an awkward codicil to the uneasy relationship he has shared with the military. To that end, Obama wrote, his administration will continue to invest in counterterrorism, intelligence gathering, cyber warfare, and countering the proliferation of nuclear weapons. Obama arrived at the Pentagon early yesterday to describe the new strategy with his defense secretary, Leon E. Panetta, and with General Martin E. Dempsey, chairman of the Joint Chiefs of Staff. Officials said it was the first time in history that a president had held a news conference at the Pentagon. Panetta has concluded that the Army has to shrink even below current targets, dropping to 490,000 soldiers over the next decade, but that the United States should not cut any of its 11 aircraft carriers, according to Pentagon officials and military analysts briefed on the secretary’s budget proposals. Panetta is expected to propose cuts in coming weeks to next-generation weapons, including delays in purchases of the F-35 Joint Strike Fighter jet, one of the most expensive weapons programs in history. Delaying the F-35 would leave its factories open, giving the manufacturer, Lockheed Martin, a chance to work out continuing problems in developing the plane while freeing up money that otherwise would be devoted to buying it in the next year or two. In the past few days, senior aides to both Panetta and Dempsey said few specific details on Pentagon budget cuts would be released before the final budget proposal is finished later this month. But a number of Pentagon officials, military officers, and military budget specialists briefed on Panetta’s plans discussed specific programs on the chopping block on the condition of anonymity. Panetta has made clear that troop reductions should be carried out carefully, and over several years, so that combat veterans are not flooding into a tough employment market and military families do not feel that the government is breaking trust after a decade of sacrifice, officials said.